Nikki Einfeld as Diana, Christine Brandes as Cupid, Nymphs above. All photos by Cory Weaver. “Of all sexual aberrations, chastity is the strangest.” Anatole France. Spanish born Vicente Martin y Soler is not well known today, but in the late 1700’s his celebrity shared the Vienna spotlight with fellow opera composers Mozart and Salieri. His comedies gained great popularity, among them L’arbore di Diana. The daring West Edge Opera has revived this work with a colorful, dynamic, and amusing production under the name The Chastity Tree. As Goddess of Chastity, Diana creates a tree to protect and monitor her chaste nymphs. Her natural rival, Cupid, the God of Love, is infuriated and declares war. What ensues is a clash of values and temperaments, with a woodsman and two shepherds inducted by Cupid to tempt the nymphs and Diana herself. Complications and matings ensue. The libretto was written by the roguish Lorenzo da Ponte, who declared it his favorite creation – this from the famed librettist whose words grace three of Mozart’s greatest operas, Don Giovanni, Marriage of Figaro, and Cosi Fan Tutte. Of da Ponte’s 40 plus librettos, only “Cosi” and “L’arbore di Diana” were cut from whole cloth, the remainder being adaptations of existing works. Some would argue that da Ponte was effective at writing lustful characters as he was merely fictionalizing himself. In fact, despite a number of other shared successes, he and Martin y Soler disbanded their partnership over competition for a woman. The music of The Chastity Tree is very much of its time and place. From the classic era, it still embraces baroque traces in tinkling harpsichord and clipped recitatives. Yet, several arias of all the principals are engagingly melodic. And while the ensemble pieces won’t compete in beauty or complexity with the likes of Donizetti’s “Chi me frena in tal momento,” they possess charming quality and wonderful harmony. The Bay Area is blessed with and attracts an abundance of great young opera singers, and West Edge always casts well from this enviable pool. Lyric coloratura soprano Nikki Einfeld enchants as Diana in both her singing and acting. She attacks runs and trills with authority and delights as an actress. As her antagonist, soprano Christine Brandes excels as the gender-mixed Cupid. In his North American debut, Malte Roesner offers his warm bass-baritone and great charisma as woodsman and womanizer, Doristo. Finally, Kyle Stegall’s clarion tenor rings as shepherd, Endimione. Although performances are exemplary, the opera might seem arid without director Mark Streshinsky’s madcap interpretation. 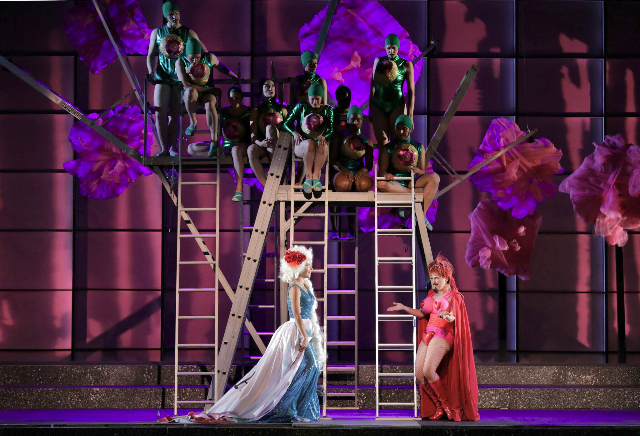 The staging is limited but stunning with the centerpiece of the set being a maze of metal ladders representing the foreboding tree and huge pink puffs as its flowers. Other set elements are hot pink curtains around a huge bed and a hot pink dressing screen. Costumes even brighter than the set fill out a vivid, comic look. Sparkly solid colors are worn by all female characters. Singing nymphs don candy cotton wigs, and dancing nymphs wear bright green swimsuits and caps but are most distinguished by bullseye-like monobreasts! Adding to the overall feel is the movement, often by the everpresent members of the Sarah Berges Dance Company who populate the tree as nymphs when not in floor movement. But even more significant is the non-verbal playful lasciviousness of the characters, which might embarrass the early audiences of the opera. The Chastity Tree, composed by Vicente Martin y Soler with libretto by Lorenzo da Ponte is produced by West Edge Opera and plays at the Pacific Pipe Warehouse, 1391 West Grand Avenue, Oakland, CA through August 19, 2017. Reposted by Victor Cordell and For All Events.